Great War Wednesday: Britain’s Battle Rifle | "Granny Beads and Grocery Store Feet"
At dawn on 23 August 1914, the head of the German sledgehammer carving its bloody path through Belgium ran into the British Expeditionary Force — “The Old Contemptibles” — near the Belgian border town of Mons. The Germans outnumbered the British three to one and obviously felt secure in the knowledge they could steamroll any opposition since they made no attempt to seek cover initially nor to break marching formation. That false notion proved the death of scores of the Kaiser’s soldiers. The British opened up with rifle fire at around 1,000 yards and as the Germans came on they withered like orchids in a drought. After the battle, many German soldiers believed they had blundered into a line of British light machine guns. In fact, they had not; they had encountered instead their first combat against British riflemen and their Lee-Enfield SMLE rifles. No discussion of British martial endeavors during the first six decades of the last century could be complete without mention of the Lee-Enfield Rifle. First introduced in 1895, the Lee-Enfield served as Britain’s standard issue infantry battle rifle until the FN FAL took its place in 1957. Even after giving way to the new semi-automatic, the Lee-Enfield continued in front line service in several capacities, including dedicated sniper rifle, into the 1990s. By contrast, in the same time period, the US army fielded the Krag-Jorgenson, the Springfield A3, the M1 Garand and carbine, the M-14, and the M-16 as standard GI equipment, six totally different rifles to old mum’s one. 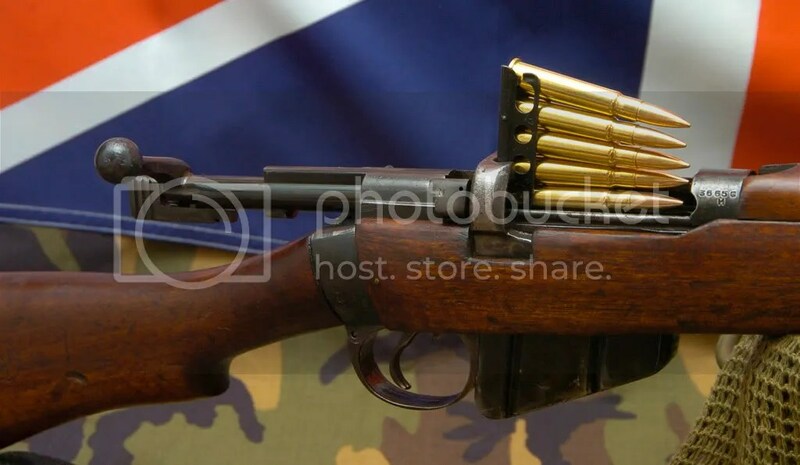 This is a Lee-Enfield stripper clip aka “charger” with five rounds at the ready. The Lee-Enfield, or LE, or “The 303” was one of the first infantry rifles to use the bolt-action. German brothers Karl and Peter-Paul Mauser perfected the bolt-action some years before and armies all over the world quickly grasped how much more effective a bolt-action rifle could be when compared to the other rifles of the day. With a bolt-action, a soldier could easily sight his target and fire in all four standards shooting positions: prone (lying flat on the ground), sitting, kneeling, or offhand (standing with no support). What’s more, the introduction of box magazines meant rifles could generate much greater firepower in a fraction of the time as those Germans at the Battle of Mons discovered to their dismay. This image shows the charger in place and ready for the soldier to push the rounds into the box magazine. The advantage the L-E had over other contemporary rifles lay in its magazine capacity. All other battle rifles of major powers like the German K98 Mauser or the Russian Mosin-Nagant 91/30 had five round magazines. The SMLE could hold TEN rounds, which translates into five more shots without reloading. It’s important to note here these early rifles did not have detachable magazines like our modern weapons such as the M-16, AK-47, or Uzi. A soldier didn’t carry a bandolier of loaded magazines ready to swap out nearly instantaneously like a World War 1 version of Rambo. Instead, all of these bolt-action rifles had to be loaded one of two ways: the soldier could laboriously press one round at a time through the action and into the magazine or he could use “clips” which are also called “charger clips” or “stripper clips.” These little tabs of metal held five rounds perfectly aligned and secured so the solder could fit the bottom of the clip into a notch on the rifle and with a firm push of the thumb, seat five rounds into the magazine in a single fluid motion. Two such clips and the SMLE was loaded to the gills with ten .303 rounds. Since the British magazines held ten rounds instead of five, soldiers had to reload half as often as their enemies and on a battlefield where a second could cost a man his life, those five extra rounds could mean the difference between a muddy bed in the trench dugout or a muddy grave. 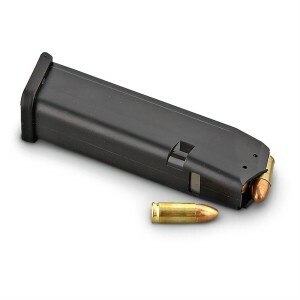 This is a 9mm detachable pistol magazine for comparison purposes. The Germans at Mons who thought they were up against light Maxim type guns were actually facing British soldiers with state of the art rifles AND a training and firing doctrine that enabled the “Old Contemptibles” to blunt the German attack even with the staggering disadvantage in numbers. The Germans didn’t know it, but the Brits they were marching into like so many ducklings behind their mother were training to the British firing standard of “The Mad Minute.” At the dawn of the Great War, every British soldier had to complete the Annual Personal Weapons Test or APWT. This test consisted of scoring no less than 15 direct hits on a 12 inch diameter target firing offhand at 300 yards in 60 seconds. Ponder that a minute, please. To qualify as a British infantryman, you had to be able to stand on your feet with a rifle which weighed at least ten pounds loaded, shoot at a dinner plate on a stand three FOOTBALL FIELDS AWAY, and HIT IT AT LEAST 15 TIMES! Holy bolt blisters, Batman! Remember, the rifle only held ten rounds so to complete the Mad Minute, the soldier HAD to reload at least once. Frighteningly for the Germans, 15 hits was the bare minimum. Most British soldiers could average at least 20-25 hits in the same time frame. To this day, the record for the Mad Minute is 38 hits (from three football fields away, remember that) in 60 seconds by Sergeant Alfred Snoxall. That means he had to reload AT LEAST THREE TIMES. Amazing. With lead like that coming downrange, its little wonder the Huns thought they were facing Maxims, but no, they were just ordinary Tommies doing what they’d been trained to do by a generation of snarling sergeant instructors. As for the Battle of Mons, the Germans eventually forced the British to retreat because of overwhelming numbers, but the retreat was in good order and allowed the French to secure their flanks all because the British knew how to work a bolt-action rifle.